Vandalism in the theater props? Call in the 7th Grade Sleuths! Time to update your image? Justina (pronounced HoosTEEnah) is intrigued by the school drama queen’s request that the Sleuths find out who carved her name on the backstage scenery (although fellow Sleuth and best friend Ig isn’t so charmed). The 7th grade genetics research project requires family interviews to “discover” your personal DNA… maybe the mystery of Ju’s frizzy blond hair and hazel eyes among the dark browns of her Puerto Rican family can be solved! So who is Ju?? Enjoy this first book in the 7th Grade Sleuths series for Multicultural Children’s Book Day or any day – there’s much more to this Blueprint of Life Project than Ju expects. 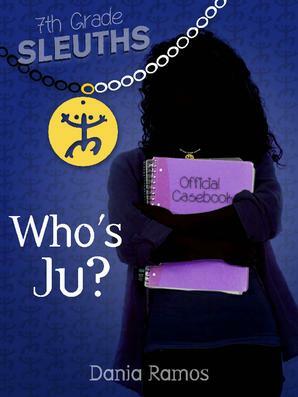 Book info: Who’s Ju? (7th Grade Sleuths, book 1) / Dania Ramos. Northampton House Publishing, 2015. [author site] [publisher site] [book trailer] Review copy from the author for Multicultural Children’s Book Day 2016; cover image courtesy of the publisher. My book talk: When blond middle schooler Ju finds a mysterious letter while researching her personal DNA project for school, she hopes to fit into her Puerto Rican family better, but the amateur investigator discovers questions far bigger than the 7th Grade Sleuths’ current drama club vandalism case. Sara’s name is carved into drama club scenery, so the young actress asks Justina, Ig, and Gunther to find out who did it – before the theater teacher does. As the Sleuths check on suspects and alibis during school hours, Ju tries to interview her parents for the Blueprint of Life Project (major science grade), but they evade her questions. Searching family keepsakes in the attic, Ju locates a photo of herself that she’s never seen and some strange correspondence. Ju tries dyeing her hair brown to match her parents and sister, then allows stylish Sara to update her wardrobe (goodbye, funky handmade sweaters from Mami and Auntie’s craft shop) and hair (hello, flatiron) to fit in at school. Will Mami and Papi finally answer her questions about the letter and photo? Will little sister Delilah ever stop pestering her? Will best friend Ig finally start talking to the new Ju? I’m looking for more diversity mysteries for kids so thanks for sharing your great review at the Multicultural Children’s Book Day Linky! !